Take a walk in Monet's garden by moonlight! 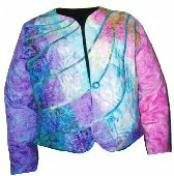 Splashes of dreamy color swirl around this elegant semi-fitted jacket, with its flattering curved hemline and easy, dart-free construction. The fabulous fit will make it your favorite jacket! Uses 11 batiks and adapts the Pop Top Jacket. Pattern includes all sizes XS - XXL, 4-26. KIT includes pattern and similar fabrics for outer shell of jacket. It does not include button, notions or lining fabric.